The latest attempt to shake down the taxpayers and citizens of California took place two days ago (October 3, 2018) with the launch of a new "partnership" between government agencies, non-government organizations, for-profit corporations, and a new entity called Veloz. The launch was heralded with a telephone press conference that I've titled, "The Sky Is Falling." Wednesday's press conference and subsequent press release did nothing to change my position. Mary Nichols - the very nice Chair of CARB (California Air Resources Board) - said nothing that I hadn't heard her say many times over the last two decades in support of electric vehicles and their touted promise of cleaner air, etc. You can do a search on TheAutoChannel.com website and you'll see that we've reported on Mary since at least 1997. We also have a couple of videos of Mary on our YouTube pages. The difference in this announcement is the amped up nature of the hyperbole used to try making their message more believable and important. The tone and words used in the announcement was one of panic; of impending disaster; of world-ending calamity. With all of the threats of horrific catastrophe, I wondered if they purposely selected October to make this announcement because this is Halloween month. Then I remembered that it's also just a few weeks away from Election Day. Here's the situation: If we (the editorial "we") are facing the immanent end of the world as we know it because of man-made climate change that is caused by the burning of petroleum oil abiotic fuels, then why the heck are we fooling around with electric cars. Electric is not clean. The production of electric power is filthy. The production of lithium batteries is filthy, and it involves the use of what amounts toslave labor. I have nothing against electric vehicles. I believe that they are the future - and I said this during my statement/question in Wednesday's press conference (I come on at about the 47:30 minute mark in the YouTube video). I agree that electric cars are thrilling and exciting to drive (of course, when autonomous driving with computer controlled state-mandated speed limits kicks in, how would anyone know that driving an electric car could be exciting? But this is an issue to discuss at another time). For now, electric cars are the future...the rather distant future. How much in the future? I don't know, I'm not a soothsayer - I may say some things that can soothe, and I always try to say the sooth, but I'm not a soothsayer. I reckon that electric vehicles will become the norm in about, oh, 30 to 75 years after I'm dead (I'm nearly 67, so there'll be quite a wait). To the question that I posed to the panel in the phone press conference, Ron Nichols (president of Southern California Edison) talked about how California is 40% carbon free in electric power supply. That still leaves 60% that's not carbon free. If we're facing global extinction why is 60% okay? Where is there evidence that being at 60% is not killing us? I'm not saying that 60% or 90% or 10% is killing us; I don't know the answer (and frankly, neither do they, but that's not the point). If we are facing annihilation, and the only way to save us is to force people to buy electric vehicles that they can't afford and don't want to buy, then why don't we take the sensible immediate step of admitting that ethanol is safe in all internal combustion engines and mandate that all internal combustion engines use E30 or E40 or E85? Hey, I even have a good catch phrase that the promo campaign can use: "Stay Alive, Use 85... E85!" Now you may say to yourself, "Hey what does Marc mean when he writes that people are being forcedto buy electric vehicles?" Good question, thanks for asking. The whole point of the "The Sky Is Falling" press conference was to announce that a TV commercial campaign was commencing that is intended to convince people to buy electric cars. The Veloz people revealed that studies show that an enormous number of people don't know anything about electric vehicles and that 50% or so can't name any electric vehicle. As a marketing expert (yes, I am a marketing expert), I would tell you that the only reason why so many people don't know anything about electric cars, and why they can't name a single electric car or brand, is that they don't care. It isn't important enough. And the younger generations don't have the passion for automobiles the way us older people did. So, how do you make people care? One way is to exaggerate the benefits or the negatives of a product - in advertising it's called "puffery." The word "puffery" is a nice way to say "lies." Impending doom of the planet Earth fits nicely. 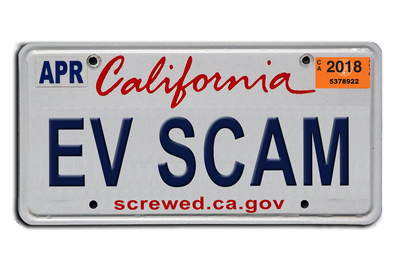 The other way to make people care is to assess fines and fees, such as the addition of egregious fuel taxes and vehicle registration penalties, which California has already done...and there's more on the way, including penalties levied on the automakers if they don't sell the required number of electric vehicles in California. I believe that in the private sector this is commonly called extortion. When Ron Nichols, the community-minded person that I'm sure he is, acknowledges that there is still a long way to go to get electric clean, why didn't he say to me, "Hey Marc, using more ethanol is a great idea because it's still going to take years to get all electric power in the U.S. off coal, and it's going to take decades to cycle out the hundreds of millions of internal combustion engine vehicles. While we're working towards that goal, let's encourage everyone to use more cleaner burning ethanol, after all, we've got all of humanity and the animal kingdom to save!" Unfortunately, he didn't say that, or anything close to it. Instead he talked about the hope of having 5 million electric vehicles by 2030. He didn't say whether he meant 5 million in California or the entire country. For the sake of his ideological position, I hope he meant California because nationwide 5 million would be just a statistical pimple on the hind end of a blip on a graph. Although, if he meant 5 million in California, it's nearly as insignificant: there are more than 35 million vehicles registered in California in 2018. Even if the total numbers didn't grow by 2030, California would still have more than 30 million internal combustion engine vehicles and only 5 million EVs on the road. Are we trying to save Earth or not? Wouldn't it be much better, much cleaner, much healthier, and much safer if we could say that the 30 million ICE vehicles were using better-cleaner-healthier-safer E40, E50, E60, E70, or E85 while we're waiting for clean electric to become a reality? I think so, and do you know why I think so? Because we have the world to save (so I'm told). After Ron finished, Mary Nichols took a shot at replying to me. But she didn't. What she said was that she didn't want to debate the issue. That's the problem with Mary Nichols, she never wants to debate the issue. She wants to skirt the issue, to hide the issue, to stifle conversation about the issue...and she's done this for at least the 20 years that I've been aware of her. She then suggested that I don't know the facts. That made me laugh to myself. I didn't laugh because I think that I do know the facts, but because how would she know if I knew the facts since she's never responded to anything that I've written about her or California Air Resources Board. The one way for her to find out if I know the facts would be to debate me, or have someone from her staff debate me - or just talk to me - or just talk to people who know ethanol. Of course talking and debating won't happen because the entire reason for California to go down this path is to increase revenue to the state so that the politicians can buy more votes. The whole thing is one giant scam. And in the meantime, California Governor Jerry Brown is having his family's land evaluated for oil and natural gas fracking. Remember what the pigs in George Orwell's "ANIMAL FARM" said, "All animals are equal, but some animals are more equal." Ethanol is the fuel of the future, and it's available right now for hundreds of millions of vehicles on the road in America, and billions of vehicles around the world. If you want to save the world, this is a great starting line. Legendary Motor Developer Calls Electric Cars An “Environmental Fraud” …”Dangerous False Path”! Standing on the wrong side of history. You are right to call out the meddling in the markets to make electric cars happen faster by some officials, and the now boring fear-mongering about climate change. However I believe you are wrong about the date when electric vehicles will become the norm. Electric vehicles will be cheaper than ICE vehicles by 2025, which means that by 2025, almost every car, every truck and every tractor newly sold will be electric. Also, an electric car lasts much longer on the road than an ICE car and needs less maintenance, which means that there will be less cars made overall. You also need to factor in the autonomous car industry. An autonomous car used in a car-hailing service can replace ten regular cars. And the leaders of that market (Waymo and GM) are planning on using fully electric cars or hybrid plug-ins (for some of the cars that Waymo bought). That's what's really going to reduce emissions on a global scale. Standing on the wrong side of the oil industry's wallet, but not history. Historically, I'm correct. Some are projecting that electric vehicles could be cheaper than ICE vehicles by 2025, but it's just a projection. The same kind of cost projection was made in the past 5, 10, 15 years about what would happen by 2010, 2015, 2025. But I think the telling comments are from Ron Nichols in the press conference. Nichols could only project 5 million electric cars (in Calif) by 2030. If he thought that electric cars would be cheaper than corresponding ICE cars by 2025, I think he would have upped his estimate. Steve Majoros didn't comment on this except in very general terms. However, let's say that Nichols estimate does factor in better electric pricing, and that 5 million electric cars are actually a very optimistic result of that pricing. Then, as I said in my editorial, we still have at least 30 million cars in California burning gasoline or petro-diesel. If we go another 5 years, and we now have 10 million more electric cars, there would still be at least 20 million ICE cars in California. At this point it's 2035. If man-made climate change is happening, and if it's anything close to the predictions, how can the world survive? Now, it seems from your comments that you are somewhat skeptical of the catastrophic climate change warnings, and so am I (I'm a lot skeptical, actually). But we still have regular old pollution to contend with, plus issues related to energy independence, terrorism, and the economy. So we're back to my comments that instead of sitting on our hands, we take steps now that can mitigate those issues by increasing the use of ethanol, for example. The only downside to greatly increased use of ethanol would be that people become so happy with ethanol that it diverts attention from electric, thereby delaying electric vehicle purchases. The only people who should be unhappy about this are the electric power companies. If that's the case, I personally could live with that - their heavy-handed tactics over my life have not shown them to be a friend of the average person. Regarding workmanship and reliability of electric vehicles vs. ICE vehicles. They may be better made and require less repair and replacement - hopefully this would be true. Generally speaking, automobiles are better made and it is very common for people to retain their vehicles for a lot longer than the 2 to 5 year cycle. In my family, we have gone 7 to 10 years before trading in our vehicles, and I'm in the automotive media business (I can get pretty good deals). So let's say that this holds true and electric cars last 15 years for the "average" owner, which results is fewer cars being built. This situation may not result in cars being less expensive for two reasons: First, fewer volume usually means higher prices per unit. Second, because there would be fewer purchases, the car companies still have to meet budgets to stay alive, so they will require higher profits at the time of original sale. Likewise, state and national revenue would be affected because of less sales tax revenue. This would probably mean that state and federal taxes go up significantly. Regarding autonomous cars and ride sharing services, I did take that into account in the above editorial, and I have written about this several times in the past. I believe that if autonomous driving ever really takes hold that it will change everything, and all projections will be out the window, just like the disruptions talked about by Tony Seba in his presentation. I'm still watching it. If I come across anything that I disagree with or think is eye-opening to me I'll come back and say so. In the meantime, you may wish to read the editorial I wrote about autonomous cars almost 3 years ago: https://www.theautochannel.com/news/2015/11/26/162527-autonomous-driving-may-kill-automobile-industry.html. I understood from your answer that there are 35 million cars in California. If so, then 5 million autonomous (and electric, because it's cheaper to run so the go-to choice for the ride-hailing companies) can cover that need. I'm not a skeptic of man-made climate change as defined by climatologists, however the democrats use fear-mongering and exaggeration in order to get votes and sell the whole package of interventionism in the economy and handouts. Climate change won't be a problem because the share of solar electricity generation has been growing exponentially for 20 years, doubling every 2 years, which means that we're only about ten years from solar being the source of more than 90% of all electricity generated, worldwide. Other industries that produce large amounts of CO2 will also be disrupted. One example is the farming and meat industry, which will be disrupted in a few years by lab meat, meat produced by cellular culture, a process much more energy and water efficient and that produces only a fraction of the CO2 produced by conventional farming. Not to mention that it will be cheaper than conventional farming, which means that conventional farming will peak (like oil demand will peak) and decline. So to me there's very little doubt that the Paris Climate goals will be exceeded. Maybe ethanol has a role to play in that and I don't have a problem with it. I read your editorial, and although I believe you are wrong about the date at which autonomous cars will be fully functional (the first launch of a commercial service by Waymo will be in 2018 in Phoenix), I agree that this is a death blow to the auto industry. There will only be few survivors that won't have the same cashflow as before, they will either be providers of autonomous car ride-hailing services or sellers of autonomous cars for ride-hailing services. The reason for that is that using a ride-hailing service will be cheaper than owning a car, let alone buying and owning one. Of course some things will be lost : We won't have the pleasure of driving for instance, and there are privacy issues. But many things are to be gained. The time that we use to commute will be replaced by time to sleep, time to read, time to work. Also commutes will be shorter because there will be less congestion. There will be much fewer cars on the road, the parking spaces will be used to build housing, and the air will be clean. Another major gain is that this will be the end of reliance on Russia, Saudi Arabia and other shifty countries for our oil needs, and the final death blow to the current system of Venezuela. Military spending on the Middle East will also decrease considerably, because oil will essentially be worthless. So overall I'm optimistic about this disruption that is set to begin later this year, and maybe scale up significantly in 2019 or 2020, triggering the disruption of the oil, steel, and insurance industries. I'm generally in agreement (or hopeful that you're correct) with everything you wrote in your latest post. I'm not a fortune-teller and I've witnessed first hand the disruption caused by external entities on existing players. On some occasions I was the disruptor (fashion, broadcasting, and Internet industries), and on some occasions it happened to advertising clients of mine - the most notable being Tower Records. However, in my editorial regarding the California Air Resources Board press conference/announcement, I was generous in suggesting that vehicle ownership will remain stagnant at 35 million. I did this again in my first response to you. I did this because it's not necessary to advance the ownership statistics to illustrate the points I was making - that regardless of whether there are 5 million "clean" electric vehicles on the road in California or 15 million, there are still many millions of "dirty" ICE vehicles on the road. And this number of ICE vehicles would be greater than the number of ICE vehicles that were on the road in California in each year from the introduction of the automobile up until probably the 1990's (I'm not talking about total combined, just per year). The point of this is that if, for example, the number of ICE vehicles on the road in 1980 (approx. 20 million) was causing a drastic environmental problem, then how could 30 million or 25 million in each year leading to 2035 not be severely compounding the drastic problem? The fact that 5 million or 15 million electric vehicles are on the road doesn't reduce the problem (electric cars don't eat the carbon emissions of the ICE vehicles). At best, the electric vehicles limits the drastic compounded problem, but a drastic compounded problem is still a drastic compounded problem. The solution to this is to reduce the carbon emissions of the ICE vehicles, and the only way to do that is to have those vehicles using higher ethanol-gasoline blends, or just ethanol fuel. You are taking the position that the growth of ride sharing service will reduce the need or desire for vehicle ownership. But that might only be true in dense urban cities. You have to remember that each year, while cities become more dense, more people are also moving to suburban and rural areas. And in America we have lots of rural areas. Comparatively empty states like Idaho, Iowa, Montana, North and South Dakota, Utah, Nevada, Wyoming, New Mexico, and Nebraska are growing rapidly (but not to the point of becoming Manhattan-style dense). Even some states with significant populations, like Florida, Texas, Pennsylvania, Arizona, and Colorado have enormous tracts of suburban and rural areas. People in these states will still own and drive their own vehicles - some electric, but many ICE. Waymo may wind up being nothing more than a historical notation, but I do accept that whether they are a winning survivor or not is irrelevant in the long term...someone(s) will survive and succeed, at least until they're knocked off the next disruptor. Google (Alphabet) is also likely to disappear at some point because of all the reasons pointed out by Tony Seba (I'm still watching the video). We've already seen many, many giant companies in the last 20 years drop dead. There's no reason for Google to survive, especially as government attacks on them worsen, and their own inconsistent and illegal policies bring on more and more legal problems. Okay, back to the Seba video for me.